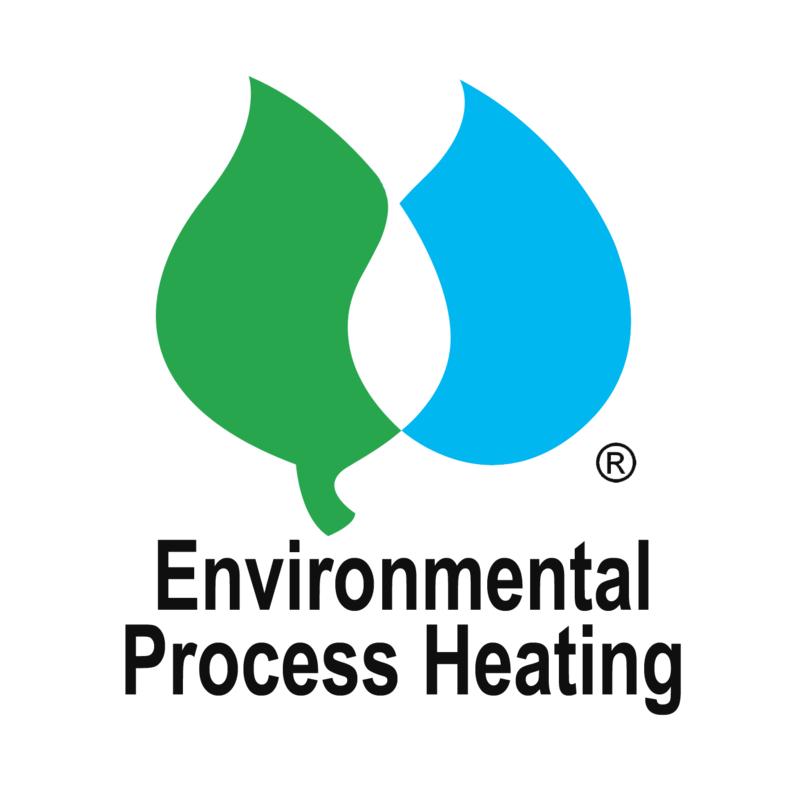 News from AB&CO · TT BOILERS - Process Heating & Heat Recovery. The two high pressure steam boilers are delivered to one of the world's largest companies within production of industrial electro-mechanical equipment. The boilers are special designed with features complying with customer's demands. More about customised electric steam boilers. 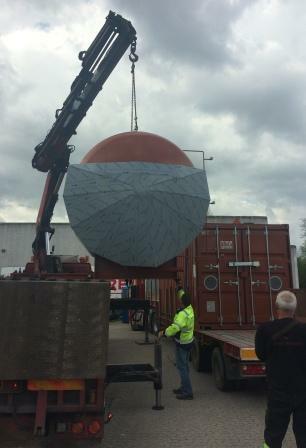 Loading of large flue gas recuperator. The unit will utilise the waste heat from incineration of oil sludge at oil field facility in Angola. The incineration of sludge oil is based on Danish technology. More about flue gas recuperators. 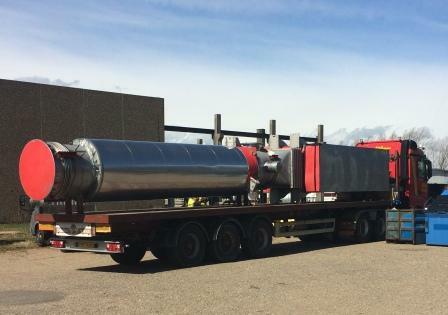 For one of Europe's' largest producers of industrial boilers, heat exchangers and thermal equipment this 468 kW steam boiler is delivered as a special skid-mounted solution. The unit will be used in a test bed facility in Stockholm. More about customised electric steam boilers. Special designed heater solution for heating of nitrogen using different steam sources is ready for dispatch to a leading refinery in Saudi Arabia. It is used in a chemical spray drying application. This solution is made complete in high grade stainless steel and has previously been delivered to the same customer 10 years ago. More about special process gas/air heat exchangers. The K-DH electric steam boiler module solutions have within 2 weeks been shipped to five countries and will be used within food production and chemical application. The special design makes the solution both economical and flexible in more than one way. More about the modular build steam boilers. The world largest manufacturer of chemicals (US) is now receiving an advanced customised boiler for their plant in Germany. This electric steam boiler has a capacity of 156 kW and is providing steam at 44 bar. The unit is to be integrated in an existing advanced control system and thus provided with an extensive amount of special control and surveillance facilities. 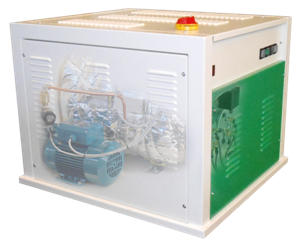 More about customised electric steam boilers. Utilising waste heat is possible by AB&CO special modular coil design. Substantial amount of energy can be recovered. Get the full package from AB&CO, starting with a consultant job to discover the potential in your particular situation. More about heat recovery from exhaust gas. Steam heating of drying air is used in many processes. These pull-out steam heaters under manufacturing, are used for a drying plants made by a world-leading supplier of special drying plants in their branch office in Slovakia. The steam air coil must comply with Pressure Equipment Directive (PED) when delivered to EU. AB&CO delivers at the moment 25 steam air coils to the customer. More about process air heaters. Electric thermal oil heater under ercetion at the workshop - for electrical process heating on a plant producing noice reduction batts. More about thermal oil heaters. 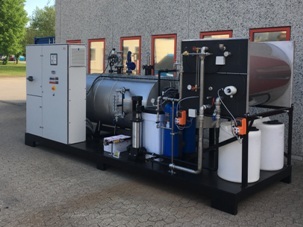 A container with electric steam boiler and accessories is now being delivered for the largest chicken slaughterhouse in Scandinavia. 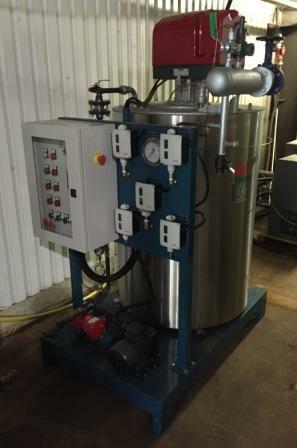 More about electric steam boilers. AB&CO is now delivering a very large process air heater on 2,3 MW - for a major drying facility in Indonesia. 6 power stages ensures a complete capacity of 2,3 MW. That requires more than 3500 A at 3 x 440 V ! Not only Europe is going electrical, Asia is also very far implementing electrical process heating. More about electric process air heaters. An old customer from Hungary is now having another delivery of TT BOILERS customised electrical solution. This time including a common 1400 kW power board servinge the 2 x 700 kW steam boilers. More about electric steam boilers. Shipment prepared for the second thermal oil heating system delivered for totally two plants producing insulation material in Denmark and in Poland respectively. For each system AB&CO deliver one 6 m long exhaust gas preheater cooled by combustion air, two 6 m long exhaust gas recuperators cooled by thermal oil (HTF), one auxiliary gas-fired 1000 kW thermal oil heater in container and all accessories which is all skid-mounted on base frames for easy and fast installations. More about thermal oil heating systems. A complete thermal oil heater unit with burner for fish oil is delivered mounted in container for an application in Norway. More about container solutions. The product range of very economical standard TEKNIK steam boilers have been extended to cover also oil and gas-fired steam boilers and steam generators. Recently a steam generator 300 kg/h have been installed in Sweden. More about economical / affordable steam generators. 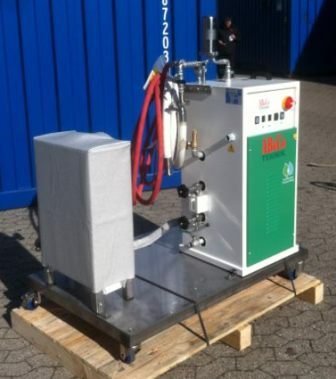 Recently AB&CO have delivered a package of steam heaters for pressurised process air for a major Austrian entreprise specialising in recycling plastic material. Mar15 : For Tanager in Norway a TEKNIK 15 electric boiler 15 kW / 3,5 bar is delivered. Parts in contact with steam and base-frame is made in stainless steel. The solution is on wheels and equipped with steam hoses. This is a very affordable price-attractive clean steam boiler! The client is a producer of biochemicals, and needs to be flexiable in regards to both cleaning and heating application in the production line of their new factory in Norway. 3 (three) large flue gas recuperator (heat exchangers) and a supporting thermal oil heating system - totally 5 MW - is now shipped to the factory in Aalborg, Denmark. Later this summer a similar system will be delivered to the factory in Poland, but totally 6 MW. 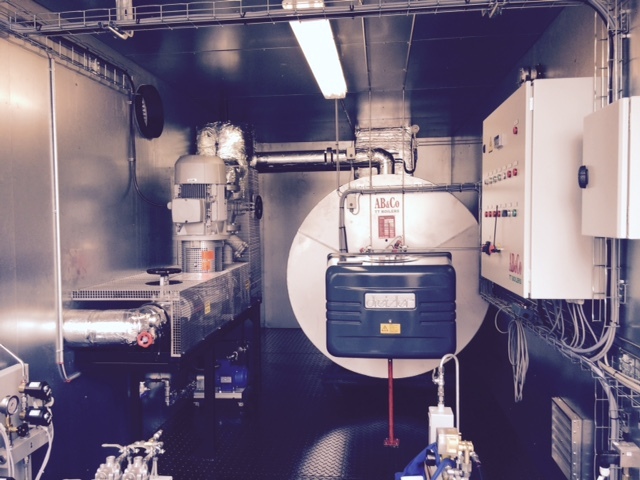 For a major research institute in Switzerland, an electric steam boiler is delivered with a design pressure of 120 bar. The high pressure steam is to be used in an advanced test-bed in conjunction with R&D project concerning methods for production of environmental fuels. The website of AB&CO is mainly a collection of technical information related to industrial heaters and heat exchangers. The new design will give you as a technician an easy and fast access to your specific requirement for your particular technical task. You will also find a lot of extra technical information, not only about the large range of products and application, but also general technical explanations, such as photos of special designs, 3D sketches, diagrams, formulas, equations and table values. Visit the new page at https://www.abco.dk. In 1988 AB&CO was founded. In 2018 it was 30 years ago. Obviously a lot has happened during the years, but customised process heating have been the key competence all the years - from design to manufacturing. More about the R&D Workshop. Your personal data registered at AB&CO is limited to the absolute minimum enable us to forward a quotation based on a inquiry send by you, and to book a order that you have placed with AB&CO according to order confirmation. More about compliance to af GDPR at AB&CO. The lists are not complete, but represent only an extract of our references worldwide. Details of the deliveries and the most recent deliveries are not presented in respect of the confidentiality about our customers and their projects. AB&CO have for the 9th time in recent years been awarded with the highest possible creditworthiness rating. AAA is a D&B rating given only to companies with an exceedingly strong ability to meet current payment obligations. Denmark is a country where companies have generally very high creditworthiness. Still only below 2% of companies in Denmark are rated AAA - and only 0,5% has been awarded this rating in more than 3 years. Today AB&CO design more steam generators, steam boilers, thermal oil heaters and recuperator than ever before, for other manufacturers. Recently for a Swedish customer making large steam generators build into containers and then all manufactured in China. More about design and R&D for you. We announce news from AB&CO on Linked-In. Join us, be a follower and get the news when news are news. AB&CO have today got the latest ISO 9001:2015 certification of quality management to our extensive services worldwide. The services comprise boilers, heaters and process heating systems - from dimensioning to start-up. AB&CO is now able to assist customer with support in case financing becomes a challenge due to the global bank situation. The official national credit fund in Denmark called 'EKF' can help in financing the purchase of AB&CO products. The arrangement is based on an individual evaluation of the customer and country, and will involve a fee for the financing. The fee will depend on the risk that is considered by EKF, but is normally below 5% sometimes down to 1% only. More about financing your purchase with AB&CO by the Danisk state. GREEN ELECTRICITY IS THE FUTURE ! Throughout Europe energy is made by wind-power, solar power, hydro power and non-fossil fuels. Cars runs on electricity from wind power generated in the the night-time - and process heating is provided by electrical boilers and heaters. AB&CO is a leading actor in this huge environmental step. Standing in front of the electrical company car, Marcus from the R&D workshop is carrying the smallest 6 kW TEKNIK steam boiler - on his left side you will find two 1 T/h electric steam boilers ready for dispatch. The deliveries of economical electric steam boilers up to 270 kg/h are now on the highest level ever. After customers in Denmark, Sweden and Norway have become frequent customers, also Finland and the three Baltic countries has join the club of key-markets for TEKNIK steam boilers type K-DH. The TEKNIK electric steam boiler type K-DH is a range of small boilers that in capacities goes from 2 kg/h up to 270 kg/h steam and up to 10 barg. This steam boilers are developed mainly for sporadic steam requirements during smaller or longer periods of operation and stop/stand-by. These units are typically used for small food processing applications, small breweries, institutes, institutions, labs, test beds, pilot plants etc. Also in connection with existing steam installations, these small units proof efficient being used in remote spots that need steam in small amounts, and thereby avoiding large steam piping being led from the main system al the way to these spot locations. On the other hand these boilers are not suitable for real 24/7 operations i.e. constant operation where steam must never be interrupted and the steam boiler must be of a rigid heavy-duty design that can accept very harsh condition and failure in proper operation to a certain degree. For such application, it is recommended to use the industrial TT BOILERS range, that goes from 5 - 1500 kg/h steam and pressure from 0 up to 40 barg. In the European Nordic countries, the electric steam boilers have become environmental, since electricity here is mainly made by hydro power, wind power, solar power and in a certain extent nuclear power. These energy sources do not lead out CO2 and do not have flue gas emission. On top of this the electricity prices in worldwide keeps on falling and is now on the lowest level ever. So electrical heating is the environmental way today - and that is easily registered in the AB&CO order books for electric steam boilers. More about all the possibilities of small TEKNIK and TT BOILERS steam boilers. The industry worldwide lead large amount of waste heat to the environment through flue gas and exhaust air. While heat recovery of process heating 10 years ago was almost a general accepted issue, it is today far feasible and thus interesting to minimise waste heat by heat recovery facilities. The industries can easily calculate how much is gained by waste heat reduction through heat recovery. But when it comes to how to find the best technical solution with lowest investment , things becomes much more complicated. AB&CO experience an increasing demand for having concrete technical proposals made on consultant basis before investing a huge amount of money. This field is precisely where AB&CO are among the best consultants on the market. 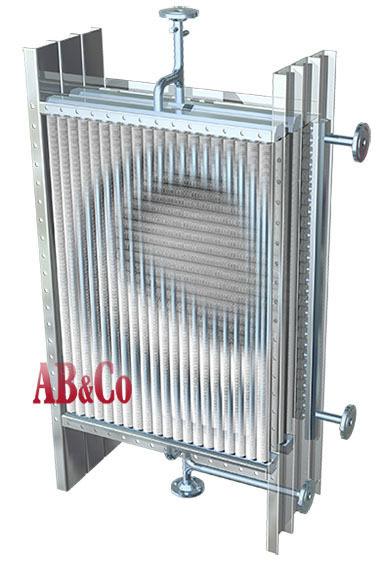 With more than 25 years experience in delivering tailor-made solution for process heating and heat recovery, AB&CO are able to make a very 'sharp shot' on how the money are spent with maximum economical gain. Often a project start like this and then develops to an order like the 'Large Heat Recovery System' (as descriped in the left column). More about this consulting service. Our new business focus on environmental process heating and heat recovery are now being symbolised by our new logo, which you will find everywhere in our material - and which remind you about our concern for the environment when designing the boilers, heaters and complete process heating systems with high efficiencies, heat recovery features and clean technology. For projects worldwide, an increasing amount of the special high quality process air heat exchangers, are now being delivered. The units are delivered to food processing plants and for chemical application covering everything from baking/cooking to conventional spray-drying. Especially steam and thermal oil is used for heating up the process air, but also dehumidifying is requested - particular for spray drying project in tropical / subtropical humid areas. Thermal oil heaters of both oil/gas-fired and electrical heated types are delivered in large quantities worldwide at the moment. One single customer ordered 10 (ten) oil-fired types each 800 kW. A customer from China, within textile processing plants, have through 8 months been ordered 6 (six) systems skid-mounted on a base frame - everything connected plug 'n play. For this customer AB&CO is now manufacturing a 1400 kW skid-mounted unit including a thermal oil heated steam boiler and hot water heater on the unit - and of course a flue gas heat recovery unit (economizer) for preheating process water. Why consider thermal fluid instead of steam ? More about this steam / thermal fluid challenge. For steam capacities below 2000 kg/h the classic fire-tube steam boilers seems to loose the battle against the compact steam generator boiler. AB&CO supplies both types of steam boilers, but the demand for steam generator boilers are huge, while the inquiries for fire-tube boilers are modest. Reason for this is obviously that the advantages of the steam generators (low water volume, fast start-up, compact, possibilities for high steam pressures and of course lower price) determine the choice. More about these steam boiler types and differences. A very large part of the boiler and heater solution delivered the last 2 years, has been delivered either skid-mounted on a base frame with tanks, pumps, accessories, piping and wiring - or build into a container. Cost studies show that "at the end of the day" it is much more economical to assemble as much as possible on the workshop - instead of on the site. Container solution and skid-mounted units is possible when the boiler and heater size is below abt. 1500 kW. Please use above address on all mail, papers and anything you send/ship to us, or you wish to visit us. Looking forward to hear from you or see you in Copenhagen sometime.